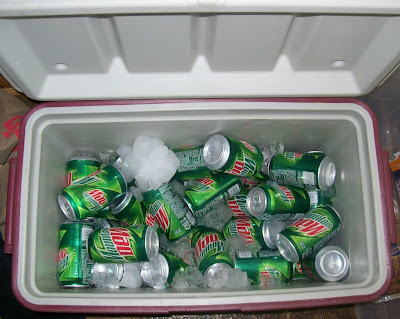 A cooler full of Mt. Dew seems like an odd choice for a "Treasure Chest Thursday" post on a genealogy blog, but if you know my family, you would be laughing right along with me. We all love Mt. Dew and well, we consider it a treasure, we even put it in a chest from time to time. Stay with me for a moment here. Tonight, I spent an hour this evening watching Faces of America on PBS. When I was finished watching, I couldn't help but think about all those great documents Henry Louis Gates, Jr. and his helpers had found on the featured famous Americans. I have documents that could rival those. Heck, my 5th great-grandmother's diary is in a national museum in DC. Still, I couldn't help but think about all the personal memories that were missing from those neatly produced scrapbooks. Where were the stories like that of my grandmother sitting on the porch steps while her blind great-grandfather told her the stories of his youth from a creaky rocking chair? Where were the stories of the two-week-long family road-trips that were the highlight of my youth? Where are the real stories, not the ones that can be discovered through documents or stuffy photographs? The reason I selected this picture to post as my "Treasure Chest Thursday" entry is that I don't want to only be remembered through documents and stuffy photographs. I want people to remember my love of National Parks, Mt. Dew, genealogy, apples, Ireland, and that above all, that family is the most important thing to me. I wish I had the connection I have with Sylvia through her diaries. I want to know how my ancestors spent their evenings, I want to know what they ate during snow storms, and I want to know what they did for fun. Unfortunately, these things are lost to the ages. From here on out, I am going to make a more conscious effort to ask the personal questions that most of us don't include in our family history interviews. If you could ask your ancestors one wacky question, what would it be and why? I would just love to talk to them at all. I can't think of any questions--except for those that would answer brick walls in my research. I haven't seen Faces of America yet, but I agree with your point that the everyday stories are what flesh out our ancestors, and make what we do more than just names and dates. Great post Inner. As much as I love Dr. Gates shows, I'm with you. There always feels like there is something missing. I never could quite put my finger on it but I think you hit the nail on the head. Ohhh, just one wacky question? I would ask my great-great grandma Emma why she snacked her neighbor on the head with a jug (the criminal case against her says why, but I'd still love to hear her tell the story). I wish we got "Faces of America" here, but we don't. Hope you enjoy your evening!